I changed this dinner just before I went off to shop. It was going to be more difficult (satay) and would not have gone together well. D wanted to use up the cut-off parts of the Pain de Mie (breakfast ‘ino recipe: truffled eggs in toast -twice!) 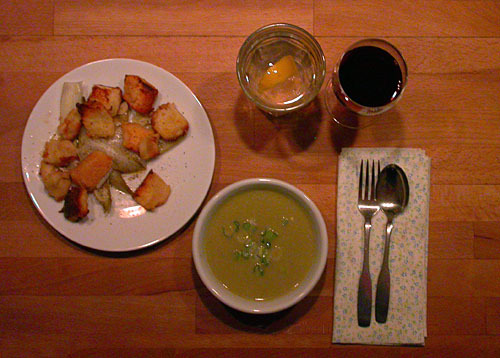 as croutons, and I realized that a soup recipe I had wanted to try would go really well with the crouton/endive salad. Yay! 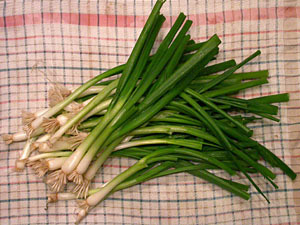 The scallion soup from Saveur is so simple: clean and trim 5 large bunches of scallions, and thin-slice 1/2 cup of them and reserve for a garnish. Cut the rest thinnish, but it’s not necessary to do this with any finesse. Cook the cut scallions in 2 Tb butter and 1Tb olive oil till soft but not brown. Recipe says 20 minutes, but it took me just over 10. 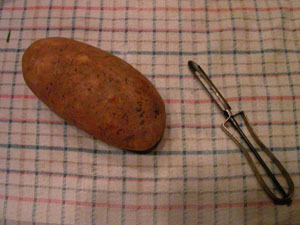 Peel one russet potato and slice thin – I used the widest setting on the Benriner. Add the potato and 2 cups chicken stock to the soft scallions. Swanson’s chicken broth comes in 6 cup cans, so I always think of it when a recipe wants 6 cups of stock. It’s good tasting and not expensive at Costco. Cook this mixture till the potatoes start to fall apart, 35-40 mins. Mine didn’t, but they were obviously done. Blend. I used the blender rather than the Cuisinart (easier to wash! ), dipping out some of the solids from the Dutch oven, and then finally pouring the soup through the strainer into the Pyrex 4 cup measure, and putting the solids and a bit of liquid into the blender to blend the soup. I returned the puree and the strained liquid to the pan to reheat, then remembered it was supposed to have cream, too. I added the 1/2 cup of heavy cream before serving, and then sprinkled on scallion slices. The soup was delicious! But it was also delicious before the cream was added, so I’d certainly consider making it without. It occurred to me also that I’d happily serve this to company. 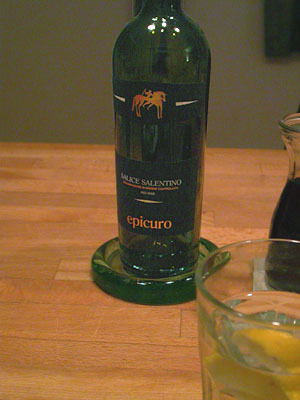 D chose an Epicuro Salice Salentino for dinner. He is trying not to repeat any wines on my 3-week “weekend”… good luck! 😉 Anyway, the wine was really good and we enjoyed everything – a very successful meal! This entry was posted in Meatless, Salad, Soup and tagged croutons, Endive, Salice Salentino, scallions, Soup, Trader Joe's wine. Bookmark the permalink.